To call Simon just a car photographer is doing a massive injustice to his range of photography and directing skills but it's not a bad place to start when you consider the list of his clients from the motoring world alone. Pick a manufacturer and the chances are, Simon has worked with them. Lets name a few, Alfa Romeo, Audi, Jaguar, Mercedes and Porsche for starters. Want a few more examples? How about Ford, Range Rover and Toyota, which still isn't the end of the list. Such is the quality of Simon's imagery that he was included in the Luerzer's Archive Best Car Ads 2000-2010 Book, included in the D&AD Annual, won an AOP award in 2015 and was again named amongst the Best 200 Advertising Photographers by Lurzer's Archive in 2014. 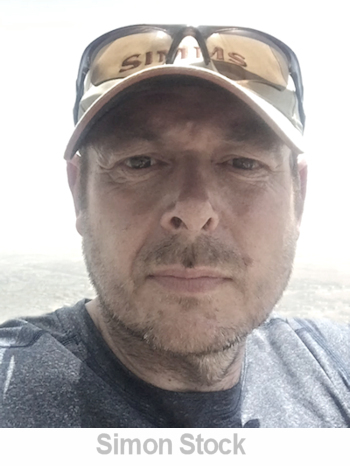 Not content with photography gongs, Simon also directs moving images too and his Acapulco Cliff Divers film achieved Communication Arts Competition's Best Cinematography Award. As well as shooting commercial imagery, Simon has shot stock photography from very early in his career and he continues to do so to this day. Why did you first pick up a camera? What photography education do you have? I have a PQE and a BA Honours Degree in photography. I happened upon a car on fire in my home town and photographed it which got published and led to working for a local paper as an apprentice for 6 months before being told to go to college and do a photography degree. Do you have a point in your career when you felt a breakthrough moment ? No, each time I get commissioned I feel the same excitement as I did all those years ago. There are a few images that are mile stones in my career but I never feel as if I achieved everything. I think you constantly have to challenge yourself to improve. My early work for BMW probably helped put me on the map for automotive photography. Have you always shot stock imagery? I always try to shoot stock images whether I am abroad or home as I see it as a long term investment and is something I am putting more time into. 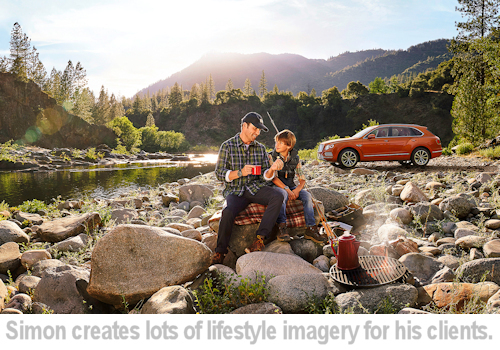 How did you go from shooting stock to shooting cars for major brands? I actually started out as an editorial photographer then moved into advertising and stock Images were a by-product of travelling around the world on assignments. Is car photography a competitive business? It is one of the most competitive areas and is getting harder all the time as budgets shrink and clients expect more shots per day but that is the same with all aspects of the business. What were the images that impressed people enough to give you a shot at shooting cars commercially? When I finished assisting I went on a road trip around California and New Mexico shooting landscapes and cars for my folio for 5 weeks and this landed almost immediately a 3 week shoot in Cape Town for Audi followed by a 4 week Mercedes shoot in California. Why did you decide to take up the services of an agent? I have had an agent from the very beginning as it is almost impossible to succeed in advertising without one. The contacts and relationships they have are vital to be commissioned for large jobs. Agencies are very nervous if you do not have the back up of a reputable agent. You have agents representing your work all over the world. Do you still have to market yourself? Shooting personal projects to market yourself is the best way to get new clients and be seen in awards, etc. I spend a lot of time shooting personal work and entering awards, etc. 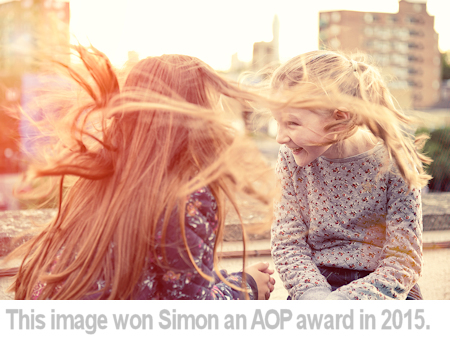 Winning the AOP award last year is a great way of getting new people to see your work. 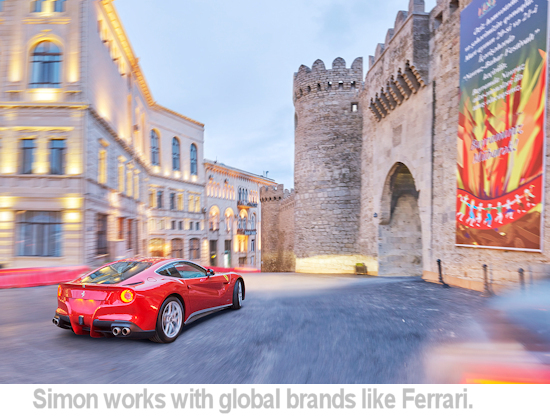 Why do major automotive brands like Audi and BMW commission you to photograph their cars? Shooting cars is a very specialised skill but you need to bring something else to the image as there are a lot of very good car photographers around. Having a style and way of seeing is very important but also being very flexible and being able to solve problems quickly is very important on location as it never goes to plan! Solving these problems is something that you learn over the years as it happens almost every time on location. What gives you an edge over your competitors? I don�t think I have an edge over my competitors, I just try to bring new ideas to the projects and make the best picture possible. It is a very competitive industry and you need to keep innovating. There�s a definite style to much of your work, how has that evolved through your career? The more you shoot, the easier it is to know what you want the final image to look like. I saw a fantastic video from a very well known fashion photographer on Youtube today, I am paraphrasing what he said, your creativity is like any muscle, the more you use it the stronger it gets. I agree with this, the best thing you can do is go out and shoot as much as you can and by doing this you will discover your style. The other thing that is paramount to success is research, look at everything that interests you from art to music to literature and make note of it because years down the line it will come back and help make that moment image you desperately want. The way I try to keep moving forward with my images and evolve my style is through personal projects. 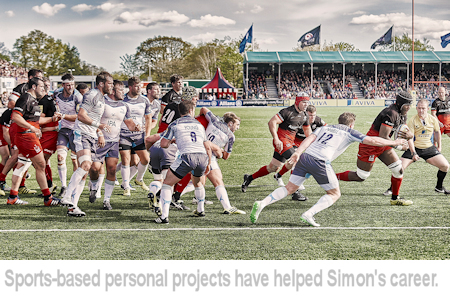 I am currently shooting a project with Saracens Rugby Union Club which are one of the top teams in the world. It took a lot of negotiation but I have been given amazing access and am shooting a project over a few months which is fantastic as it gives me time to evolve the style of the images and learn new techniques. I like to shoot personal projects that are not automotive rated as it keeps me fresh and may lead to new commissions. The Saracens idea came about partly because I shot an ad for BMW with Chris Robshaw for the Rugby World Cup and I thought I would like to take this further. You are now taking on the moving image. How has that transition been for you? Its been hard and still is. I love making films and learning all the new techniques and I think it has helped move my still images on and I am still learning which is great. I have started to light my images in a different way, taking on board some of the things I have learnt from the great DOP�s I have worked with on films. Why did you decide to add filmmaking to your skillset? I always saw my still imagery as frames from a film so it was the logical next step. Plus I love to be challenged so it is something new to immerse myself in. Many clients now want to have online footage to go with the stills so it helps if you have a commercial reel. What are the best and worst parts of photographing cars for a living? I am not sure if there any downside to shooting cars if you like cars as you tend to travel to lovely locations and spend time in places you might not normally visit. CGI is becoming a much bigger part of the industry these days which I think has made the process far more creative as you can concentrate more on achieving something spectacular and not have to shoot all the technical details such as lights, wheels etc, which is needed shooting a real car. Always take the best picture you possibly can and never compromise. What advice would you give to anyone wanting to pursue a career as a commercial photographer? All images � Simon Stock and used with permission.